abstract	 A smart coating is defined as one that changes its properties in response to an environmental stimulus. The Handbook of Smart Coatings for Materials Protection reviews the new generation of smart coatings for corrosion and other types of material protection. Part one explores the fundamentals of smart coatings for materials protection including types, materials, design, and processing. Chapters review corrosion processes and strategies for prevention; smart coatings for corrosion protection; techniques for synthesizing and applying smart coatings; multi-functional, self-healing coatings; and current and future trends of protective coatings for automotive, aerospace, and military applications. 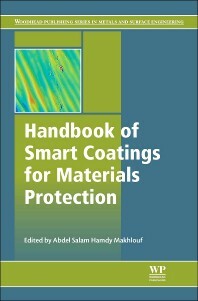 Chapters in part two focus on smart coatings with self-healing properties for corrosion protection, including self-healing anticorrosion coatings for structural and petrochemical engineering applications; smart self-healing coatings for corrosion protection of aluminum alloys, magnesium alloys and steel; smart nanocoatings for corrosion detection and control; and recent advances in polyaniline-based organic coatings for corrosion protection. Chapters in part three move on to highlight other types of smart coatings, including smart self-cleaning coatings for corrosion protection; smart polymer nanocomposite water- and oil-repellent coatings for aluminum; UV-curable organic polymer coatings for corrosion protection of steel; smart epoxy coatings for early detection of corrosion in steel and aluminum; and structural ceramics with self-healing properties. The Handbook of Smart Coatings for Materials Protection is a valuable reference for those concerned with preventing corrosion, particularly of metals, professionals working within the surface coating industries, as well as all those with an academic research interest in the field.